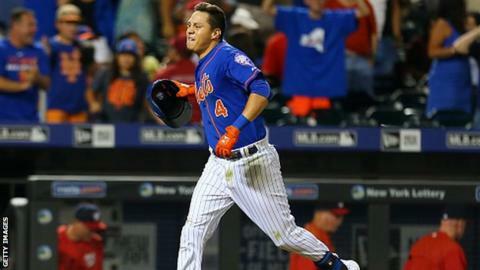 Wilmer Flores hit the winning run for New York Mets against Washington, days after crying in a game because he thought he was going to be traded. The 23-year-old Venezuelan shortstop struggled with his emotions against the San Diego Padres after believing he had been traded to the Milwaukee Brewers. But he received four standing ovations from Mets fans at Citi Field in Queens, New York. Flores batted in both runs in the game between the NL East's top two teams. His second, a game-winning home run, came in the 12th inning and triggered exuberant celebrations on home plate. Two days earlier, Flores had shed tears on the same field, believing he had been traded to the Brewers as part of a deal for outfielder Carlos Gomez. But the deal collapsed over concerns about Gomez's hip although Flores did not receive that news until he had received a send-off from the fans. "During the game I heard I was getting traded," Flores said in midweek. "I got emotional, and when I came in they told me I was not traded."